Accessories at Butcher Curnow Opticians - designer glasses, contact lenses, bi and vari focals London. 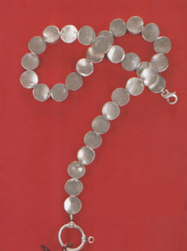 We have a collection of accessories including monocles, lorgnettes, luxury cases and elegant chains. La Loops are considerably more stylish and covetable. They are the only patented necklace for eyewear - a well-made piece of jewellery designed to keep your glasses and sunglasses at your fingertips at all times. The patented hinges rotate horizontally and vertically, so that your glasses don't fall off. The loop is made from solid silver and the cord from a range of exotic materials from leather to onyx, torquoise and wood. We have a selection of different colours and style to fit your look. We also stock Solution 30 and Lens Cloths but come in to our store for more details.